A new product has to come into the marketplace, one the company’s CFO, Neil Zelman, says will rejuvenate the billion dollar nutrition industry as well as give a sleek look to the medicine cabinet: NUDtrition ™ vitamins. Zelman has a decade of experience in the senior healthcare industry. He and his two partners, one of who focuses on marketing, wanted to provide a better experience for consumers who often aren’t sure what vitamin does what and how to store them without ignoring them. NÜD’s bottles’ patented design also highlights what parts of the human body the particular supplement targets: i.e., NÜD’s Vitamin C (1000mg per tablet) indicates it benefits oral health, alertness and supports the body’s collagen on a diagram of the human body on the back of the bottle. 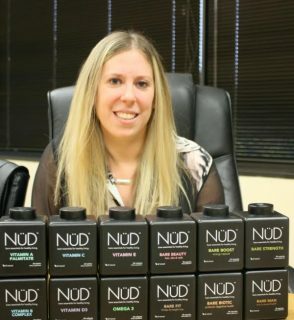 NÜD debuted at the Natural Products Expo East held in Baltimore, MD in September, 2016. “We’re very excited about our product. Right now, NUD vitamins are available online (www.nudtrition.com) and the principals are exploring growing the company to marketing our products on health food store shelves,” said COO Naomi Ostrove, who is currently readying the company’s Orangeburg corporate headquarters on Dutch Hill Road.